I have decidedly mixed feelings about Boston. I vividly recall flying to Boston as a kid in large part because it was the first plane trip I took alone. I do not recall much of the trip aside from the fact my sister lived in a really old house in Marblehead. The trip was significant because it ignited a lust for travel that has lasted a lifetime. I sourly recall the Boston Bruins breaking my heart many times as a Ranger fan. As a boy I tried very hard to convince myself that Brad Park was better than Bobby Orr--an effort that failed every time. Worse, my brother-in-law Mike liked the Bruins and teased me a good bit every time they beat the Rangers and won a Stanley Cup. As an adult, I remember Boston for a few romantic trips I took with my now ex wife (I am not sure if this is a good or bad memory). 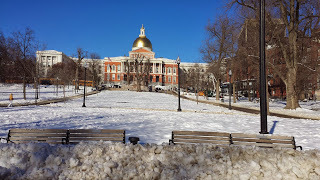 What I remember the most about Boston is an over night trip I took two years ago when I, along with many other disability activists, testified before the Massachusetts legislature's joint Committee on Public Health in opposition to H-1988 which would have legalized assisted suicide in the state. I wrote about this trip in December of 2013. Link: http://badcripple.blogspot.com/2013/12/i-testified-in-boston-problematic-trip.html Much went wrong on this trip. My testimony was terrible--I am quite good at public speaking but really screwed up that day. I had plenty of excuses. I had a sleepless night, the room where testimony was given was hot, it snowed all day and I lost my gloves. The drive home was twice as long given the fact the roads were really slick with snow and ice. Add in the city of Boston does a terrible job removing snow from the sidewalks. Despite all this the city looked great. Boston looks great today. But, there is always a but, I would prefer the snow and cold. Thanks to a deeply respected colleague who has housed me for an extended period of time I have been able to enjoy the city. How I miss the vibrant nature of city life and all it entails. My beloved labrador Kate loves city life too. Lots of people and stimulation for her. 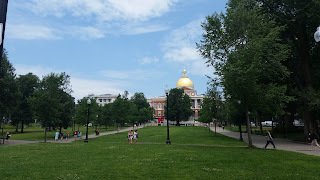 What I have enjoyed the most is the Boston Common. The Common, not commons, looks quite different today. The summer heat has radically altered my schedule. I wither in the heat. Wither is being kind. I suffer in the heat. I am at a high risk for heat stroke. I take heat warnings seriously. To adapt and avoid the heat this morning Kate and I headed out the door at 6AM. I was instantly taken back in time to when my son was a baby and I lived in the heart of Manhattan. Although I had lived in the city a long time I had never seen the city come alive. My son changed that upon delivery (pun intended). Delivery trucks abounded, men were power washing the sidewalks, trash was being picked up, portable toilets were being removed from the Boston Common, tree men were grooming the tress etc. All this was wondrous to Kate--especially the portable toilets. Her nose was seriously out of joint and had a thrilling morning. As I enjoyed the city coming to life I began to wonder. Is disability related access part of this norm? Despite lots of brick sidewalks the city of Boston is quite accessible. The subway, the T, is largely accessible unlike most cities across the USA. I have really enjoyed accessing the T. I have never used the subway or train on a regular basis. My colleague has been kind and patient as I learned the system. It is amazing what bipedal humans take for granted but here I digress. As I have navigated the T I have been struck by the large number of people with a disability out and about. I have seen a great number of people using a wide array of wheelchairs and scooters. I have observed two guide dog teams that stuck out to me as both dogs were German shepherds. I am not suggesting Boston is ideal in terms of access. Far from it, the city struggles badly during winter and lousy snow removal forces people with a disability to be house bound for long stretches of time. This is utterly unacceptable. And I return to wondering. Why is a lack of access acceptable? Why do the elevators in the T smell so bad the acidic smell of urine hurt my eyes and lungs? Of course this is a result of the homeless using the elevator as a safe toilet--another reality of city life unacceptable. What a world we live in and I wonder why Americans embrace capitalism;but I digress again. The lack of access to health care I would argue is the most important public health care problem this nation has ever faced. Frankly, getting in the door of a practicing physician by itself is deeply problematic. This is not an isolated or regional problem and is in fact a growing problem. The reasons for this refusal is not what physicians claim--it is too expensive to make their offices accessible. Most offices simply state the office is not accessible nor can they suggest a physician or office that is accessible. I have been down this road many times. I find this distressing because of the ignorance involved. At issue is civil rights. My civil rights are being violated a central point very few grasp. Getting through the gate keepers is virtually impossible and appears to me to be the typical policy of most physician offices. The Boston Globe wrote about this two years ago as have many other newspapers. More than one in six Boston doctors offices refused to schedule appointments for callers posing as disabled patients in wheelchairs, researchers at Baystate Medical Center reported Monday in a study of specialty practices that highlights obstacles to routine medical care. Legal specialists say the practice violates a federal law requiring that people with disabilities have access to appropriate care. Callers turned away by physicians in Boston and three other cities were mostly told the offices lacked an exam table that could be raised and lowered or a lift for transferring a patient out of their wheelchair. In some cases, practices were located in buildings inaccessible to people in wheelchairs. Gynecologists in the four cities had the highest rate of inaccessible practices, with 44 percent informing patients that they needed to seek a specialist elsewhere. The findings were published in the Annals of Internal Medicine. Here I relentlessly return to my observation about Boston as a city coming alive well before business hours begin. Why is wheelchair access and so called "reasonable accommodations" for all people with a disability not the norm? Why is not a central part of a hospital as an institution coming alive. I would suggest the most basic reason for a lack of access is simple--we people with a disability are not in positions of power. We are not present when decisions that can profoundly alter our life are made. Hence I harken back to the slogan "nothing about us without us". As I age and need to access health care on occasion the more I find the slogan "nothing about us without us" all too apt. This is without question not a medical concern but rather a social problem. Not much has changed since Robert Murphy made the very same point in his book the Body Silent.